The present study was conceptually embedded in the Partnership for Peace Consortium of Defence Academies and Security Studies Institutes (PfP C). It is the outcome of a close cooperation between the PfP C Track on "Security Sector Reform” and the "Regional Stability Track”. It is also part of the cooperation agreement between DCAF and the National Defence Academy. 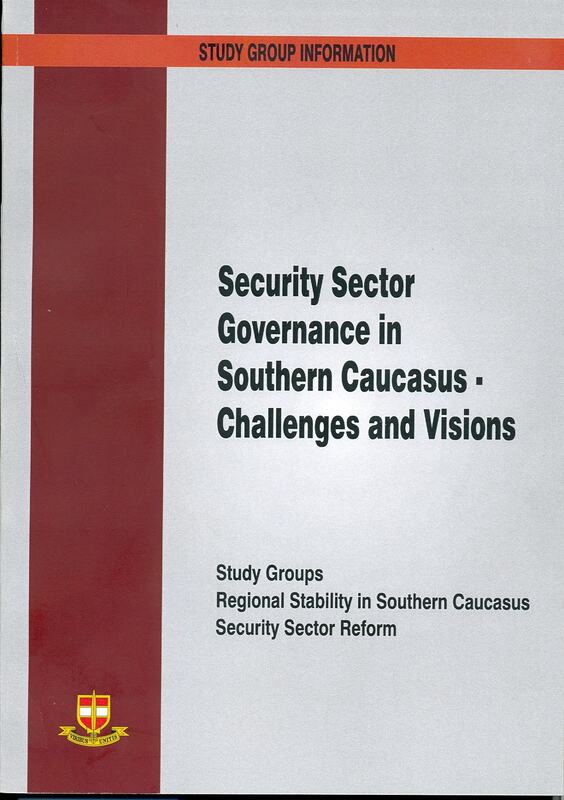 This publication is the result of the first of two joint workshops between the two tracks with the participation of the PfP-C Security Sector Reform Working Group and the Regional Stability South Caucasus Study Group. The meeting took place in November 2003 in Reichenau, Austria, hosted by the Austrian Ministry of Defense (represented by the National Defense Academy and the Bureau for Security Policy). The book reflects the excellent possibilities and opportunities the Consortium provides for interdisciplinary, comparative and cross- country studies. It shows how unconventional ideas and new initiatives can be tested without immediately having major political impacts. This is what makes the PfP Consortium so unique and deserves our support and attention. Under the new PfP Consortium governance structure the combination of a regionally oriented SG (Regional Stability Southern Caucasus) and a topic focussed WG (Security Sector Reform) was a "first” for the PfP C. The initiative was taken on the one side by the Security Sector Reform Working Group in order to start a stock-taking process regarding the status of the security sector in the Southern Caucasus countries - and on the other side by the co-ordinator of the Regional Stability Track who wished to re-launch Consortium activities in the region, as the existing Study Group had been inactive for the past year. Joint meetings are, regarding the nature of Consortium activities, not the rule, but the exception. Nevertheless, they open a wide range of opportunities - combinations of different approaches, have a wider set of experts contribute, launch new initiatives, define a topic to be dealt with from different angles and have side-meetings. On the one hand, recent elections in Armenia (May 2003), Azerbaijan (October 2003) and Georgia (November 2003) showed quite clearly the lack of democracy in those three countries. It is hoped that the velvet revolution in Georgia, culminating eventually in the step down of President Shevardnadze in Tbilisi, will have a positive impact on its neighbouring countries and also launch a more intense dialogue on a regional level. The political situation in those countries is still unstable, but the development in Georgia could be a signal to the better for the region. On the other hand, one of the consequences of the NATO- and EU enlargement rounds is the question about the future of the Partnership for Peace programme and, ultimately, the PfP Consortium. The NATO Summit in Prague and the EU summit in Copenhagen in late 2002 shifted the political focus towards the Caucasus and Central Asia, thus towards the future borders of a unified Europe. This meeting was an initiative to re-vitalise activities in a region which has been mentioned as essential for the PfP in the future. The objectives were "to assess the situation in the Caucasus Region through enhanced international cooperation and strategic research on an academic level. The main focus is to elaborate major problem areas and work on possible solutions”. To that end experts from all three republics and from two of the three unrecognized entities participated. The meeting had a pre-set agenda which helped to identify future experts and gave an evaluation of the actual situation in the region. Due to the particularity of this region with three secessionist republics and conflicting relations with each other and the neighbouring states Iran, Turkey and Russia, much accent was given to conflict settlement and the conditions under which stable and lasting relationships could be established. These are problems encountered not only in the Caucasus, but also in other post-soviet republics and possible lessons learned might be transferred. The threat perception in the region varies significantly. One of the first main findings of the meeting was that the presence of foreign military personnel is a very controversial subject with some states depending heavily on foreign armed forces on their territory and others regarding those very forces as a source of tension and a danger for their security. For some country foreign military presence is also a security guarantee toward a third country, with which conflicts are not settled yet fully. This shows once more that not only armed forces are part of the security sector, but also that it is multi-faceted. The seminar addressed a set of preliminary questions in order to carry out a modest stocktaking: where do they stand in security sector governance? Who are their allies and what is their political influence? What is the level of international and regional co-operation? How are the border guards organised? To whom do the police report to? What is the role of intelligence services? How well do parliamentarians know their role when taking decisions over the security system? How do those countries define their relationship with NATO and EU and how are those relations reflected in their security policy, what are the steps taken to bridge a possible gap? What are the problems those governments encounter when reforming their security sector? Is there something similar to a "Membership Action Plan” for these countries, or are new developments pending? What kind of stability is needed? If the existing stability is based on international stability, then there is no stability. The past has shown often enough that the international attention might shift rather quickly to another hot-spot in the world, a development described by one speaker as the ‘Caucasus fatigue’. Therefore, the reforms must be firmly rooted in the countries themselves, supported by the population and the government. From the point of view of "regional stability” the workshop was a success; all parties invited being present and discussing the given topics. However, too often political statements drew the attention away from the academic debate about Security Sector Governance. But one had to be clear from the beginning as to not expect too much from the seminar, despite the experts present. This meeting was certainly a very promising start to develop a set of activities in/for the region, which over time might integrate from a pure regional standpoint into a more topical approach.